Compact mirrorless interchangable lens cameras (MILC), like the Olympus PEN, Sony Alpha NEX and Samsung NX lines, are among the most popular cameras right now. That’s because they combine big, DSLR-quality sensors with small point-and-shoot-like bodies. Though the lenses still make this type of camera bulkier than a true compact camera, the reduction in size and weight from a full DSLR is pretty significant. That's part of the appeal (as is the relatively lower cost). There are drawbacks to this type of camera: no optical viewfinder for one, and a shorter battery life, in some cases due to the power draw from the LCD screen and/or electronic viewfinder. 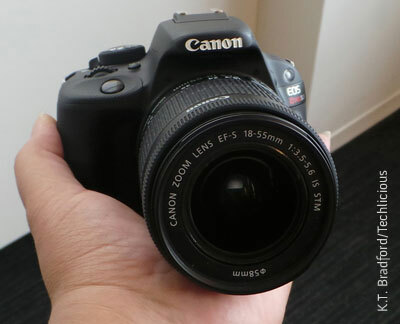 So what do you do if you want a real DSLR and you want something small and compact? Canon thinks they've come up with the answer. 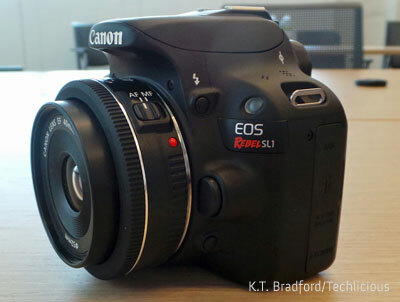 The company just announced the Canon EOS Rebel SL1, the smallest and lightest DSLR in the world. Today, at least. Weighing 14.36 ounces and measuring 4.6” (w) x 3.57” (h) x 2.74” (d), the Rebel SL1 is certainly smaller than the average DSLR, but it's not necessarily compact. Then again, when compared to larger bodied fixed-lens cameras like the GE X600 or the Canon PowerShot SX50 HS, the Rebel SL1 is about the same size and not much heavier, yet offers far more power and performance. The Rebel SL1 looks smaller when compared to normal DSLR's, but the real difference becomes apparent when you pick it up. It feels lighter than it looks and sits well in the hand. The grip is a bit small and too short to quite fit the natural curve of my fingers. It is comfortable and the rubberesque coating made it possible to hold the camera with one hand without feeling in danger of dropping it. The 18-55mm zoom lens that comes with the kit ($799) doesn't throw the SL1 out of balance, as zoom lenses sometimes do on more compact MILCs. However, if size and weight are your main motivations, you might want to check out the pancake lens that will also be available (no word on price yet). You'll still get excellent quality shots, just no zooming. In my hands-on time with the SL1 I found that I preferred the zoom lens for the versatility. It's not that much heavier than a smaller lens, and a camera that's lighter overall offers some wiggle room for adding heavier lenses – in the end, there's still less weight on your shoulder. Compact size doesn't mean a loss of functionality. This is a true DSLR complete with 18MP sensor, hybrid CMOS multipoint auto focus and other features found in the Rebel line up. The touchscreen LCD on the back is the same as the one found on the Rebel T4i camera except it doesn't swivel out. Touchscreen functionality includes point selection, menu navigation, swiping through pictures and more. 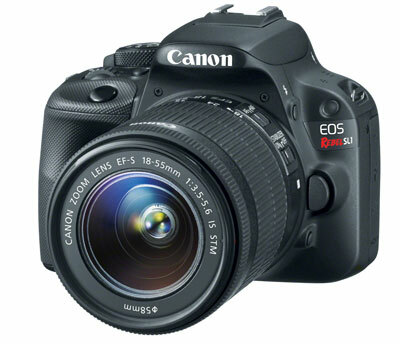 The Canon Rebel SL1 will retail for $649 (body only) and $799 (18-55mm kit). Currently, that's the only kit Canon plans to offer. The camera will be available in mid-April but can be pre-ordered now.